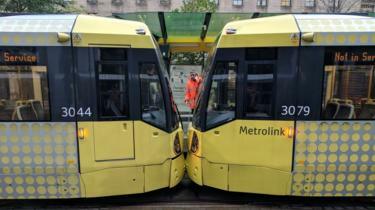 "Greater Manchester's tram network was suspended after two trams crashed in the morning rush-hour. There were no injuries and minor damage was caused in the low-speed crash in St Peter's Square, Manchester city centre, at about 08:30 GMT. The "knock-on" effects caused delays but all services resumed by midday. Metrolink apologised and referred the incident to the Rail Accident Investigation Board in line with standard procedure. A decision to temporarily stop all services will be reviewed, Transport for Greater Manchester (TfGM) said. Danny Vaughan, TfGM's head of Metrolink, said: "Quite frankly, incidents like this should not happen and I've emphasised to the operator the absolute urgency in which they need to ensure a meticulous and swift investigation is carried out." Aline Frantzen, managing director of Metrolink operator KeolisAmey, said: "We take customer safety seriously so the decision was taken to suspend all services."